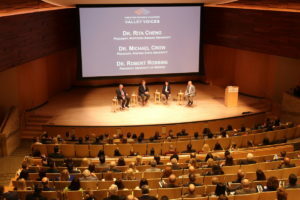 The presidents of Arizona’s public universities discussed the relationship between the business community and the university system at Valley Voices: The State of Higher Education last week. The state university presidents, Dr. Rita Cheng of Northern Arizona University, Dr. Michael Crow of Arizona State University and Dr. Robert Robbins of University of Arizona participated in a forum moderated by Todd Sanders, Greater Phoenix Chamber president and CEO. Read the full Chamber Business News article here.